Notorious Australian flop set in the Roaring 20s Sydney follows Kitty O'Rourke who, after her thug husband ends up in jail, becomes a tough gangster on her own, befriends a crooked cop called The Bagman and takes on the competition. Stuff it in yer pouch and hop off! Three cheers for vice, corruption and wild, wild women . 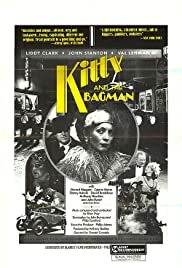 . .
Quite lavish 1981 production set in Sydney in the rip roaring 1920s underworld KITTY and the whole cast were unceremoniously repelled from the box office on first release in Australia. Pity, as it is an entertaining criminal pantomime with snazzy costumes and middle aged antics of gangsters and molls and the true razor gang wars of the Sydney waterfront. Perhaps the casting was off or whatever, but this film, several years earlier would have scored better. The timimg of the release ran headlong into a severe downturn at the Australian box office because of the video boom. I saw it on a double feature with the Agatha Christie showcase THE MIRROR CRACK'D and there were 22 people in the audience ...and it was a Saturday night. Yikes! The same production team scored well in the late 70s with CADDIE and the glorious epic THE IRISHMAN...and all are worth seeing. Good luck.